[prMac.com] Mainz, Germany - Synium Software today is proud to announce the release and immediate availability of iFinance 4.2.1, their financial tracking app for Mac. Keep track of your income and expenses in the most convenient and fastest way. Would you like to find out how your assets perform or why you keep maxing out your bank account without really knowing where your salary goes each month? iFinance 4.2 has all the answers. Know immediately what you spend money on and where your income comes from. iFinance 4.2 offers a broad range of easy-to-customize charts and reports, budgets, automatic categorization, and more. Optimizing your finances becomes a breeze. iFinance 4.2 offers numerous options for users to visually analyze their financial data. Customize charts to suit your individual needs. How are your assets performing? Which accounts show black figures? Incorporate categories and see how your monthly rent or mortgage payment, groceries, insurances or loan installments affect your finances. Want even more eye candy? Then have iFinance display your data in beautiful interactive 3D charts which even offer a better overview about your finances. Do you already use one of the new MacBook Pro with Touch Bar? Then you'll be happy to learn that iFinance 4.2 makes use of the handy bar above the keyboard. Navigation, adding transactions or configuring reports becomes so much more convenient this way. The Touch Bar displays context sensitive commands and adapts to the section you are currently working with. Does your bank offer the download of PDF based bank statements? Then simply drag&drop these documents onto the bank statement section of iFinance. Manage and archive all your statements so that nothing ever gets lost. Of course you can store any PDF document in iFinance's bank statement section and attach the files to every account you like. 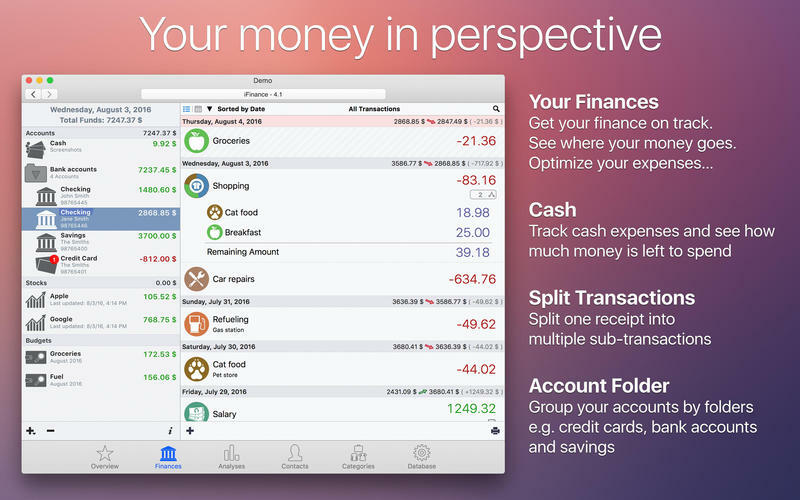 iFinance is available exclusively at the Mac App Store. Version 4.2.1 currently sells for just $29.99 USD (25% discount). iFinance Mobile is also available for iPad, iPhone, and Apple Watch and can be purchased separately. The mobile version offers the complete range of iFinance features and is available from the iOS App Store. If you purchase iFinance for iOS, the Apple Watch version is already included. Synium Software GmbH has been developing software exclusively for the Mac since 2005 and for the iPhone since 2008. The products range from productivity applications to multimedia software and iPhone and iPad applications. All Material and Software (C) 2005-2017 Synium Software GmbH / All Rights Reserved. Apple, the Apple logo, are registered trademarks of Apple Computer in the U.S. and/or other countries.